We’ve all heard of the proverbial artist who can create a masterpiece using only a toothpick and ketchup. I haven’t seen a demo using those media yet, but the one I saw in Paraty last month came close: Ch’ng Kiah Kiean (better known as KK) wielding a twig and Chinese ink. After his inspiring demo, I gave it a shot myself, vowing to try it again later at home. 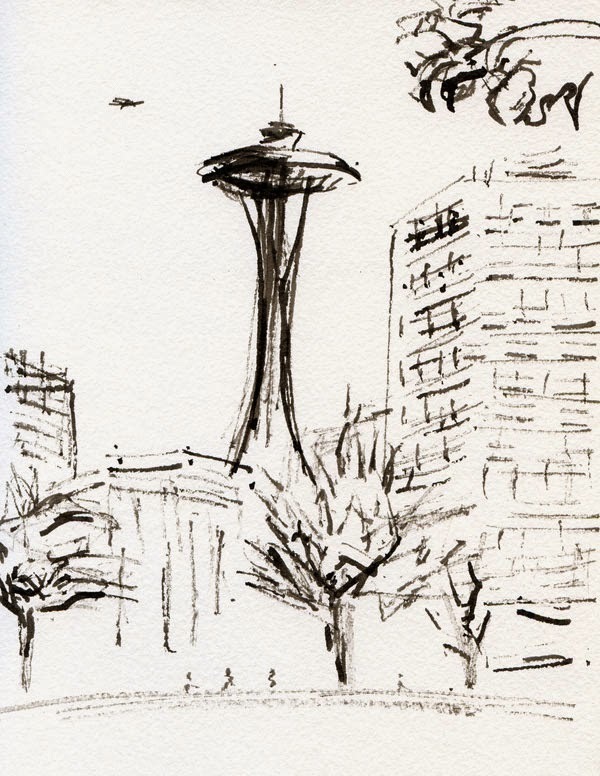 This sunny morning at the Olympic Sculpture Park, which got a huge turnout of Seattle Urban Sketchers (welcome to all the newcomers! ), I had an opportunity to give my twig a better workout. I didn’t have Chinese ink at home, so I used India ink. KK’s trick is to place a piece of medical gauze in a small jar and pour only enough ink into the jar to saturate the gauze. This trick addresses two issues: It keeps the ink from spilling (especially important when wearing a white sweater), and it allows the twig to pick up a very small amount of ink, which results in KK’s signature “dry” ink look. Once I picked up my twig, I had to dispense with a few things immediately. The first was the illusion of control. 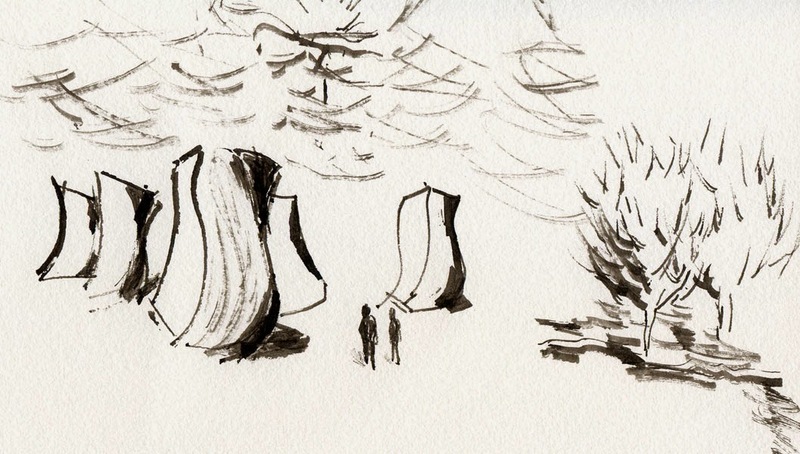 The second was my penchant for details: twig sketching is all about big shapes. The third was color. 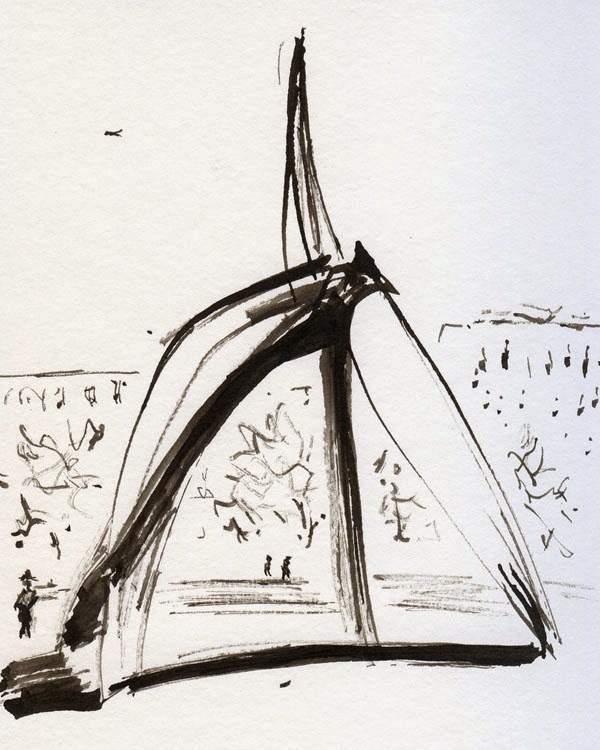 The latter was a tough one – who doesn’t want to put a big splash of red across the page when sketching Calder’s Eagle? 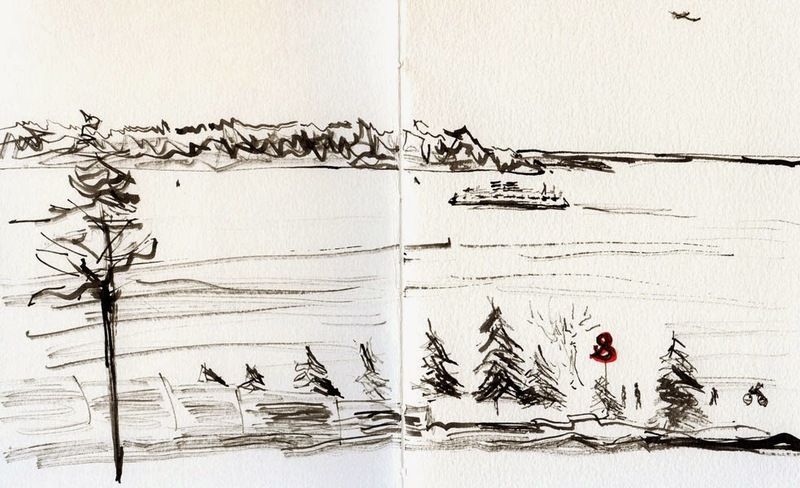 (It helped that I’d already been to the sculpture park with a sketchbook several times.) Once those were out the window, I had so much fun sketching with that most primitive of sketching tools. A big benefit of twig sketching is speed. I finished five sketches during the two-and-a-half-hour sketch outing, which may be a personal record. During KK’s demo, participants kept asking him questions about the types of trees his twigs come from, the angle at which he cuts the tips, creating sort of a “nib,” etc. Although he answered the questions, it became apparent by watching him that his magical sketches have very little to do with the twig. They have everything to do with the hand holding the twig. I had to laugh about channeling your inner KK Tina. Good sketches, but I found his technique is both seductive, and at least in my case, completely unrewarding. Yeah, I tried it too. Do you intend to keep exploring the style, or are you going back to more traditional ways? 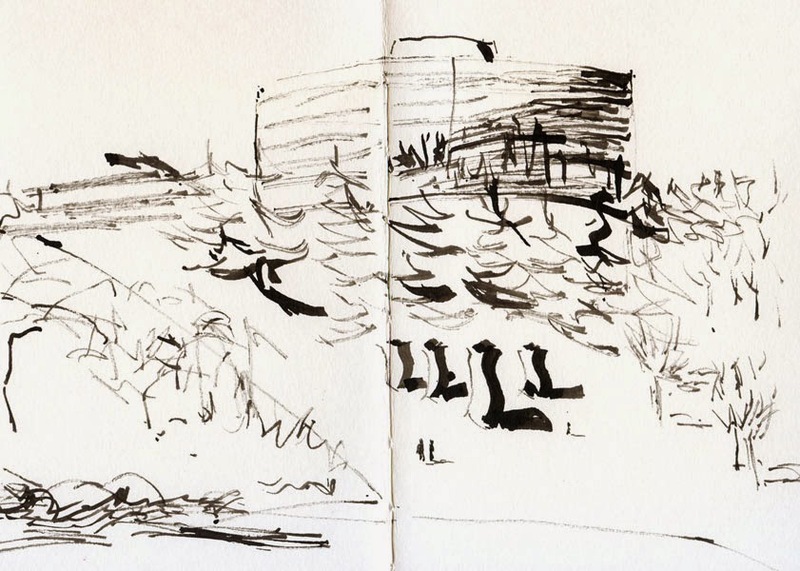 Mark, I find a certain liberation in sketching with a twig -- there's no temptation to put in any details! I'm going to keep the twigs and ink in my bag. . . we'll see how far I go with them!